Durable And Baby-Safe: Made with the safety of children in mind, sturdily constructed with toy-grade ABS+PP plastic, metal, and provides a 100% safe playing environment. Eye-Caring LED: energy-efficient and eye-caring LED creates a uniform non-flickering light that doesn't Hurt the eyes; adjustable brightness and warm white. Smart Control: Built-in PIR motion sensor and light sensors, Roome Mini+ turn on/off intelligently and automatically; Automatically learn your habits on light using, then control the light switch intelligently. APP control supported. Energy Saving: The best all-night companion for children to keep them feeling safe; great for new moms to use when breastfeeding at night (up to 10 hours on weak light mode), rechargeable. Wireless and Rechargeable: Wireless charging for a wireless life. With no charging cable required, but a power adapter, even convenient, Roome truly designed for future wireless. Built-in 1200 mAh rechargeable Battery, never worry about replacing dry batteries and creates portable and wireless convenience. 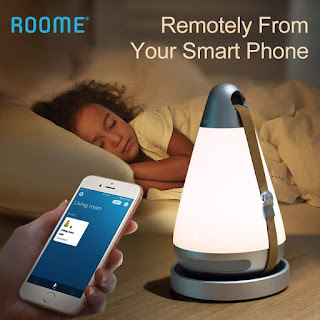 Roome dedicated in Smart Home and IoT, aim to provide you more smart and convenient life. Brilliant and water drop look, Roome Mini+ awarded GODEN PIN DESIGN AWARD, and China Good Design in 2016. Precision-engineered to resist dust. The most powerful and smartest chip ever in the night light, that the light could record the using data. Wireless charging for a wireless life. With no charging cable required, but a power adapter, even convenient, Roome truly designed for future wireless. Made with the safety of children in mind, sturdily constructed with toy-grade ABS+PP plastic and provides a 100% safe playing environment. Roome light gives out soft light that won't hurt or strain your eyes. You can hit the button on side of light to adjust the brightness to meet your different occasion needs. Blue constant light: charging full.